I set off down Princes Street, rucksack on my back and a walking pole in each hand. The centre of Edinburgh is not natural hiking territory, but from Haymarket I found a quiet off-road walking route out of the city - part of the National Cycling Network, converted from an old railway line. This took me through the leafy suburbs to Cramond and Queensferry. It took 20 minutes to walk across the Forth Road Bridge - a little disconcerting to a vertigo sufferer like me. From North Queensferry I followed the Fife Coastal Path east. I stayed at a B&B in Aberdour, spectacularly situated on the Forth opposite Edinburgh. Next day was Day 64. It started well, with fine views over the Forth from the hills above Aberdour. Then a so-called footpath took me by a hair-raising crossing of the A92 (almost a motorway) to an ugly housing estate at Cowdenbeath. For most of the rest of the day the only route was along main roads. 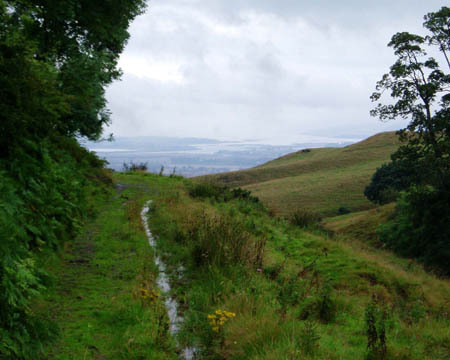 I tried an off-road route across Benarty Hill, but had to beat a retreat when I could find no way down its precipitous north side. I stayed that night in Kinross. It was raining hard next morning. I made my way along minor roads to Glenfarg, and for the first time in over 2 months I was offered a lift. A kind thought in that weather, but no thanks. I dried out in the bar of the Glenfarg Hotel, and, hey, it stopped raining. I had a fine afternoon's walking, mostly off-road by the Wallace Road to Bridge of Earn, and then entered Perth by Moncreiffe Hill. I was looking forward to the Highlands, and next day was a 25 mile push from Perth across the Highland Line to Amulree. The National Cycling Network again gave me an off-road route out of town, as far as Almondbank. From the Highland Line at Little Glenshee, a good track led over the hills to Strathbraan. From the top there was a spectacular view of a storm across the road ahead, but it missed me. Day 67 took me from the small hotel at Amulree by the Rob Roy Way to Aberfeldy. At least, the website said it was the Rob Roy Way, but there was no sign of that on the ground. 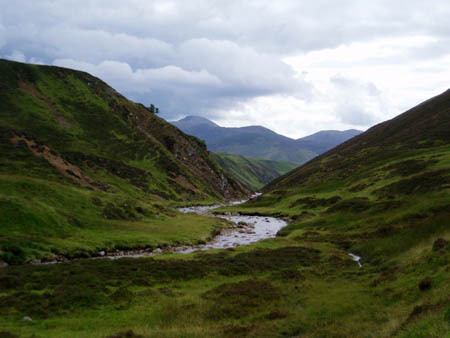 The weather was great, and the scenery up Glen Quoich and down to Strathtay was spectacular. The last few miles took me by the Falls of Moness through the Birks of Aberfeldy. Next day was fine again. I had originally planned to stay in Pitlochry, followed by a short day to Blair Atholl before a big day across the mountains. But the forecast was for the weather to break in two days, so I decided to push on to Blair Atholl and keep the last fine day for the mountain crossing. The B&B at Blair Atholl was one of the best, with a spectacular view of the next day's route. The house was shared with two well-behaved children and two less well behaved ferrets. The walk from there up Glen Tilt and into Deeside was one of the highlights of the trip - 24 miles, much of which was far from habitation or roads. From the watershed the path led down to Geldie Burn. I was relieved to find that the burn was fordable - the guidebooks say it cannot be crossed when in spate, and it would have been inconvenient to have to turn back 17 miles. A few miles further on I reached the road at Linn of Dee and the spartan youth hostel at Inverey. As predicted, the weather had turned nasty next morning, and on top of that I had developed shin splints in my other leg. So I decided to stay a second night at Inverey, and rest up before tackling the Lairig Ghru, the granddaddy of Scottish mountain passes. The tops were covered in cloud on Day 71, but at least the rain had stopped. By a stroke of luck, one of the guests at the hostel was driving to Aviemore, and he agreed to take a bag to the youth hostel at Glenmore. The Lairig Ghru crossing turned out to be the toughest day of the whole trip, exacerbated by my gammy leg, and with a full pack I would have really struggled. 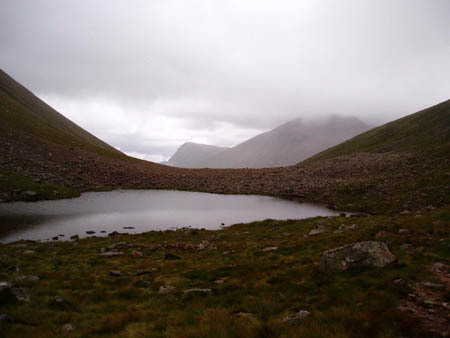 I made good progress from Inverey up Glen Lui, Glen Luibeg and Glen Dee towards the summit of the Lairig Ghru pass. Thankfully the rain kept away, and the 833 metre high pass was free of mist. But the going got rougher. The guidebook had warned me to expect a "boulder-strewn" pass, but it was a surprise to have to constantly clamber over waist high rocks. At last I reached the pass and began the descent to Speyside. It was almost 8 pm when I reached Glenmore, and I had seen only two other people the whole day since leaving Inverey, 21 miles back. All this had done my shin splints no good at all. So I needed a few shorter days. 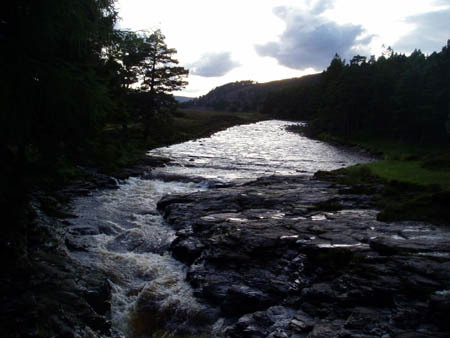 I stayed the next night at Boat of Garten, just 9 miles from Glenmore. The following day I followed the old Wade Military Road over the hills to Tomatin. On Day 74 I did just 8 miles through the forests of Loch Moy to Daviot. On Day 75 I followed the Wade road through the forest, which became the Old Edinburgh Road into the centre of Inverness.